Seoul, almost 14 hours! 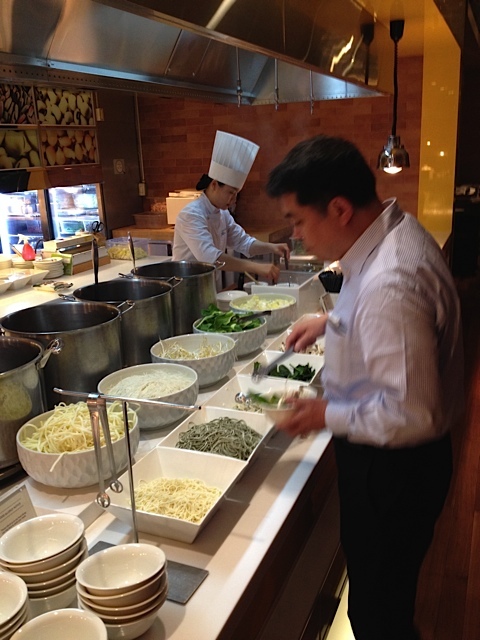 )…and have checked into my hotel in Seoul…where I’ll be attending a conference all week on Korean cuisine! 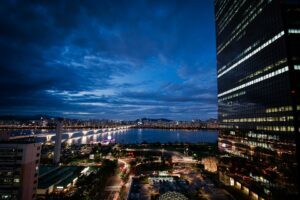 So many amazing things on my schedule: master classes with Korean chefs; a pre-dawn visit to Seoul’s famous fish market (said to be the equivalent of Tsukijii in Tokyo, 6AM sashimi included); a day at a Zen monastery to unlock the secrets of Korean vegan cuisine; a focus on Korean fermented foods…and more! Holy cow! Rare steak at 35,000 feet! Last night, I saw something I’d never seen before…nor had I ever expected to see. I was travelling Prestige Class on Korean Air, enjoying my lovely treatment at the hands of friendly and beautiful Korean Air flight attendants. When one asked me how I’d like my steak prepared, I knew it was futile to say “rare”…but I said it anyway. 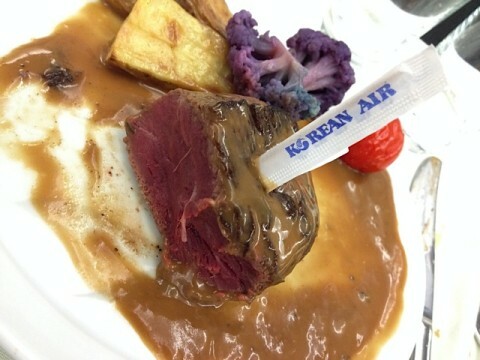 And out came…for the first time in my life…a rare steak on an airplane!!! And it was not only rare…it was meltingly tender, and delicious too! I used to consult for Delta…where I was told that by U.S. law airplane steak has to leave the on-ground commissary already cooked to medium…before being re-heated on the airplane! Maybe the Koreans flying out of JFK get a special deal!